Discover the mysterious lochs, wooded glens and quaint towns of the Scottish Highlands aboard the luxurious Royal Scotsman. Your travels take you through spectacular scenery en route to Gothic estates, historic monuments, and quintessential Scottish sites. 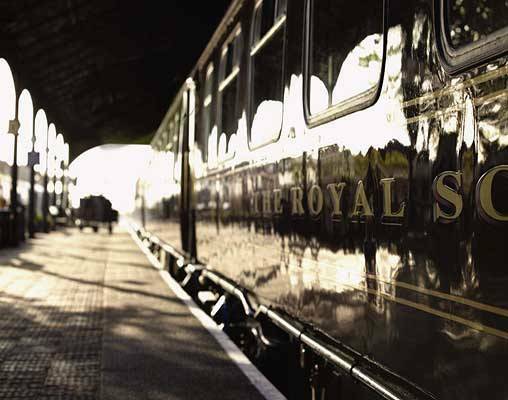 Book to travel in May and June 2019 and save 25% on your companion's fare on qualifying Royal Scotsman vacations. Book by April 30, 2019. Offer is subject to availability and may be removed at any time. Call to book by April 30, 2019 for May or June departures. Offers cannot be combined and are only valid on new bookings. Offers are not applicable for parties of 12 or more. There is an undeniable draw to the Scottish Highlands - one that brings in visitors from all over the world to see the dramatic mountainous scenery, the ancient castles and the historic sites. On this 6-day tour, you get to experience it all and travel aboard one of Scotland’s most notable luxury trains, the Royal Scotsman. 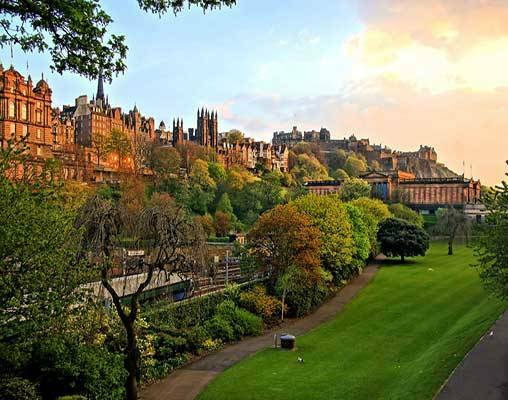 The tour begins in the capital city of Edinburgh, and from here, the train travels to beloved locations, including Boat of Garten, Culloden, Keith, Fort William and Glasgow, amongst others. Savor the beauty of the West Highland Line as you make your way past locks and moors, through emerald valleys and along waterways, and enjoy daily opportunities to disembark the train and to sightsee and immerse yourself in Scottish culture. Try your hand at traditional activities or a tour at Rothiemurchus Highland Estate, feel the weight of history at Culloden Battlefield, sample some traditional Scotch Whisky at Strathisla Distillery, experience the diverse landscape of Isle of Bute, take a private home tour of Mount Stuart and so much more. The West Highland line is full of magic, come and see. The Royal Scotsman departs from Edinburgh Waverly Station in the early afternoon and travels north to the 'Fair City' of Perth. Enjoy afternoon tea as the train continues on the Highland line through Dunkeld, Pitlochry and Blair Atholl. The rolling hills of Perthshire transition to dramatic peaks and valleys as you travel north towards Aviemore, gateway to the Cairngorms National Park. Your destination this evening is the peaceful Highland village of Boat of Garten on the private Strathspey Railway. An informal dinner is served, followed by entertainment in the Observation Car. Overnight train. Travel the short distance by coach to Rothiemurchus Estate, in the heart of the Cairngorms National Park. Choose from a number of activities including clay pigeon-shooting, fishing or a guided tour of the estate with a Park Ranger. Afterwards, enjoy a warm welcome from your hosts as refreshments are served in the hunting lodge. It's the perfect opportunity to learn more about this family-run estate. Return to the train for lunch. Later disembark in Inverness to visit Culloden Battlefield, site of the last major battle fought on British soil. Listen to our Highlander as he paints a vivid picture of how this battle forever changed the way of life in the Highlands. Travel east towards Keith. Enjoy an early evening visit to Strathisla Distillery, the oldest working distillery in the area. It is home to the malt used in one of Scotland's most famous blends, Chivas Regal. 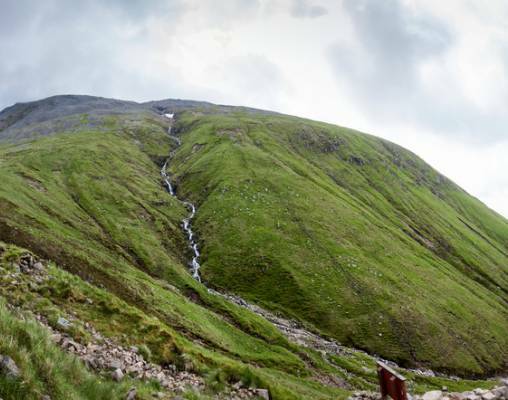 Savour some spectacular panoramas on the way south through Aberdeenshire and Angus. Sit down to a formal dinner before enjoying traditional Scottish music in the Observation Car. Overnight train. Breakfast is served as the train leaves Dundee. Travel south through the former Kingdom of Fife, crossing the Firth of Forth across the magnificent Forth Railway Bridge. Disembark in Edinburgh to visit the Royal Yacht Britannia for a guided tour followed by a light lunch. Alternatively, enjoy some free time to explore Scotland's vibrant capital city. Rejoin the train in the early afternoon and travel west through Falkirk. Near the mouth of the Clyde estuary lies Craigendoran, the starting point for the majestic West Highland Line. Enjoy afternoon tea as you travel along the edge of Gare Loch. Take in views of Loch Long and Loch Lomond. The train descends almost to the water's edge at Ardlui, and then climbs Glen Falloch with its many waterfalls. An informal dinner is served on the way to Spean Bridge followed by lively musical entertainment. Overnight train. Today the train travels west, passing through Fort William with views of Ben Nevis, the UK's highest peak. Disembark at Arisaig for a romantic walk along the beautiful Morar Sands, with breathtaking views across to the Isle of Skye. Lunch is served back on board as the train retraces its route towards Fort William. Here you’ll visit historic Glenfinnan in the company of our Highlander who brings to life the stories of Scottish heroes. Enjoy afternoon tea at Inverlochy Castle Hotel before returning to Fort William. 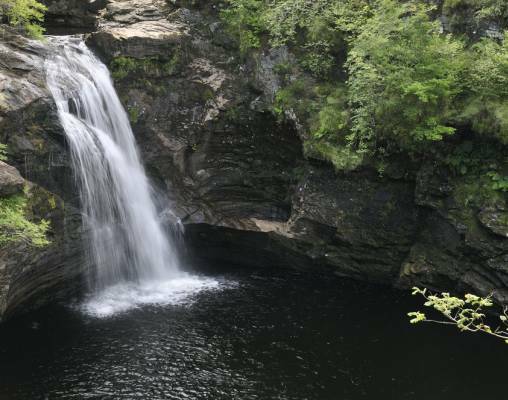 Alternatively, a guided hike through the scenic Nevis Gorge is available, weather permitting. Return to the train in Fort William and relax on board before an informal dinner. Overnight train. Savour the dramatic Highland scenery en-route south to Glasgow and the west coast. Board a ferry in Wemyss Bay and cross to the Isle of Bute. The island embraces a variety of landscapes: seashore, moorland, farmland and forest. From St Blane's Chapel at the south of the island to the abandoned townships in Glen More at the north, every stone has its tale to tell. 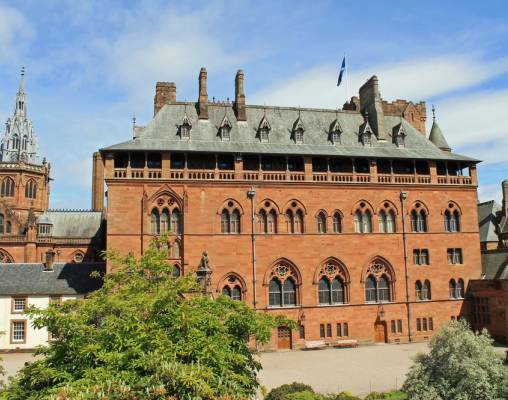 Visit Mount Stuart, Britain's most spectacular Victorian Gothic house. Mystifying interiors and arguably Scotland’s finest privately-held collection of family portraits provide fascinating talking points. Enjoy afternoon tea in the Drawing Room before you explore the house and garden. Return to the train in Gourock where a formal dinner is served on the move to Kilmarnock. Retire to the Observation Car for coffee and local entertainment. Overnight train. Enjoy a leisurely breakfast as you travel east before arriving in Edinburgh for your onward travel arrangements. 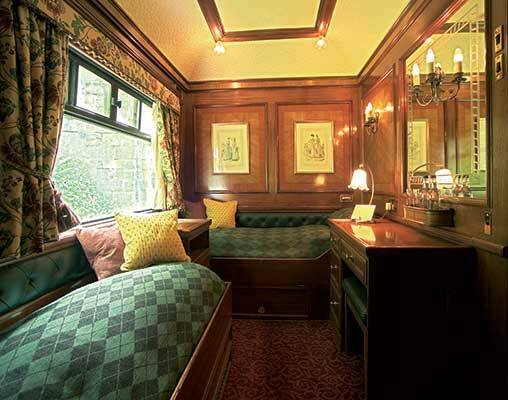 The Sleeping Cars provide sixteen twin and four single State Cabins, beautifully fitted out in rich marquetry, each providing a comfortable and intimate area to relax and enjoy the stunning scenery of Scotland. Each cabin has its own private bathroom with shower, wash-basin and toilet, constant hot water, high quality toiletries and fresh fluffy white towels every day. Each bed is furnished with one feather and one foam pillow, feather duvet and cotton quilted bed covers. Non-feather duvets are also available on request. Other facilities include a lower bed, dressing table, full- length wardrobe, hairdryer, individually controlled heating, cooling ceiling fans, opening windows and cabin service call button. Enter your details below if you would like to be notified when 2021 dates and prices are available for The Royal Scotsman- Grand Taste of the Highlands. *Pricing above is based on the currency conversion effective 3/18/19, and can vary based on the exchange rate at the time of booking. Prices are per person and include all table d'hôte meals, all alcoholic and other beverages, sightseeing per itinerary and accommodations on board based on two people sharing a twin compartment. Single pricing is available. Please contact a rail specialist for details. Air fare is not included in the price of this vacation package. Itineraries are subject to change and full details will be confirmed with your tickets.